This book was one of my first acquisitions, and it’s still one of my favorites. It’s a small trade paperback, but is packed full (the print is pretty tiny) of recipes collected from all over the South. Though I know people who would be incredibly offended by this, I must admit I’m pretty happy that the author construed “the South” to include Texas and Louisiana: those states bring in some really fun flavors. Each recipe in the Book comes with an attribution: the brownie recipe I tried, for example, was from Mrs. Frank M. De Friese, of Knoxville, TN. It can sometimes be surprisingly tough to find vintage cookie recipes. There’s about one awesome cake recipe for every housewife, but flipping through old books really shows that most fancy cookies and bars are pretty recent inventions. In Tennessee, though, they apparently got a little more creative. 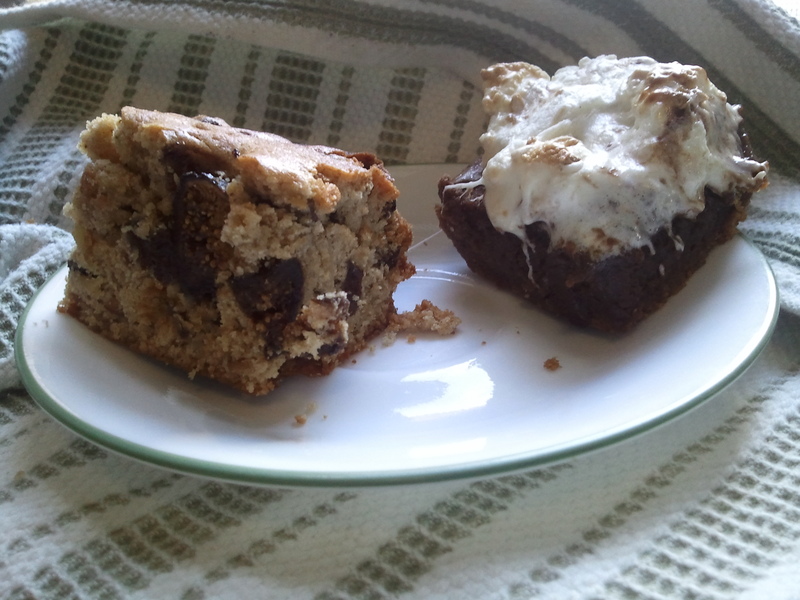 To whit: Mrs. De Friese came up with the absolutely awesome idea of melting marshmallows on top of brownies. Her recipe calls for another chocolate layer on top of the marshmallows – frosting or fudge (I’m sure fudge frosting would be perfect too), but I felt this might be too cloyingly sweet. So, I added my third layer at the bottom: I used a graham cracker crust under the brownie and the marshmallow topping to turn these into my very own S’Mores Brownies. Because I was baking for a crowd I figured one pan of brownies (however rich and gooey) would not quite to it. So, I went in the complete opposite direction…and tried out a Scripture Cake. In a Scripture Cakes recipe, ingredients are set out by Bible verse references so, for example, “cake” is indicated by 1 Kings 19:6, which reads, “Behold, there was a cake baken on the coals.” I was incredibly confused when I saw a bunch of Bible verse citations in my cookbook, so of course I immediately resolved to try the recipe. The internet tells me that these cake recipes were used in the nineteenth century to simultaneously teach girls baking and Bible; the other versions I came across are of the same type as the one in my book – plain cake with dried fruit, nuts, and a little honey. Very Holy Land. 2. Spread the graham crumbs in the bottom of a 9 x 13 pan, pour in the 3 tbsp. sugar, and shake around to mix things up. Pour the melted butter over the crumbs, mush it all around to moisten all the crumbs, and pat the mixture evenly across the bottom of the pan. Bake for 8 minutes and set aside. 3. Melt the chocolate and butter together over low heat. 4. Add the sugar and eggs and stir until the mixture starts to lose some of its graininess. 5. Stir in the bourbon, soda, salt, and baking powder. Then add the flour and mix until smooth. 6. Pour the batter over the graham crust and bake for 15-20 minutes, until the outer edges of the brownie are set and crusted and just the middle is still fudgy. 7. Remove from the brownies from the oven and place marshmallows on top. Put the pan back in for about 3 minutes, until the marshmallows are puffed and starting to brown on top. 8. Take the pan out again and turn the oven up to broil. Spread the semi-melted marshmallows around as evenly as possible and put the pan back in the oven for another minute or two until the top gets nice and brown in places. 9. Let cool and enjoy! The topping will be a gooey mess, but if you didn’t know that already and don’t enjoy it, you need to take your inner child out to a campfire sometime really soon. 2. Butter and flour a 9×13 pan. A tube or bundt pan would also probably work well. 3. Cream the butter and sugar until fluffy (about 2 minutes on high in a mixer). Add the eggs and beat until pale yellow and light in texture. 4. Add the honey, baking powder, and spices and mix well. Keep the mixer on low and alternate adding milk and flour (I usually do each in 3 batches). Mix just until blended. 5. Dump the nuts and fruit in and mix until evenly distributed. 6. Pour the batter into the pan, spread it evenly, and bake for about 40-50 minutes until the top of the cake is golden and a toothpick inserted in the center comes out clean. *I substituted a few prunes and some chopped candied ginger with good results – just make sure you have 4 cups dried fruit. The tip about substituting bourbon for vanilla is interesting. my mother made cakes but I don’t think we ever used vanilla or even owned any. However we didn’t have bourbon either. Irish ancesters were either boozy or teetotal, no middle ground there! The only time the top came off a liquor bottle in public was when the milkman made his Xmas deliveries and when we made the Xmas puddings in October. My father’s advice was to “drink the brandy and breathe heavily on the pudding mix for maximum effect”. Guess who the teetotaller was in THAT marriage. So, how was the Scripture Cake?